Squares. As old as God, and yet quintessentially modern. Since square one, since Adam and Eve squared off and were scared out of Eden, we have known squares, and yet the ability to make perfect squares in great numbers didn’t come until the dawn of the machine age. In a sense, the perfect square, simple as it is, will never exist outside of our mind, because we will never be perfect, and nor will our machines be. Making the perfect square is as impossible as squaring a circle. And we leave you with a question: If -1 x -1 is 1, then is the devil squared an angel again, and is every angel at its root a pair of devils? They are one of the simplest shapes in the universe. But did they exist, were they appreciated, before we made them? Could nature have squared anything, made four right angles, no more and no less? Could nature have tried to square a circle or would it have been too scared, or would it simply not have cared to try? 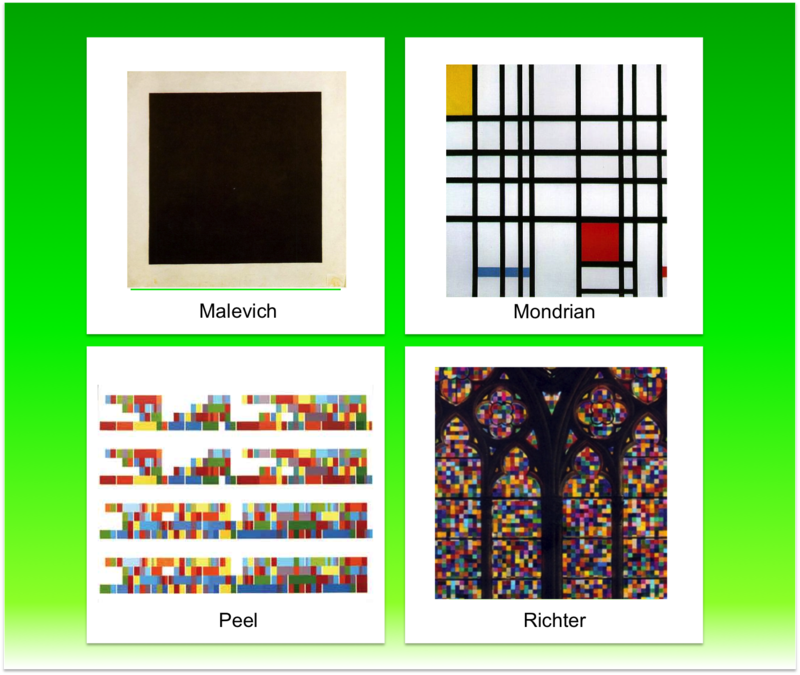 Squares are perfection (Malevich), cornerstones and backbones (Mondrian), rhythm (Peel), silence, absence, omnipresence, essence and even a dance. The more modern we became, the more squares we made and the more perfect they became. We fell in love with squares, square-eyed as we are nowadays. Malevich thought all that could be painted had been painted, and that the highest perfection an artist could create, and the one thing he could add to the history of art, was the perfect mathematical shape of something like a square. In doing this, man stepped one step ahead of nature. On the left, you can see a visualization of the most refined, complex and complex music in the world, Bach’s Goldberg Variations. James Peel’s visualization makes this complexity painfully obvious. Then Mondrian, that iconic figure, of whom Bonnie Greer said that he was once everywhere. And finally, Richter with the ultimate cathedral window, conjuring up our childhood memories of the coloured squares that came up when the TV was broken, and offered a glimpse into the void.